If you’ve been following Creative Market’s journey this year, you know that it’s been a particularly busy one. Over the last year, our team has grown rapidly with 15 fantastic new Creative Marketeers joining our ranks to help us fulfill our mission of helping creators turn their passion into opportunity. Last summer, after spinning out from Autodesk, we became an independent company for the second time. Then, immediately after our spinout, we kickstarted our biggest undertaking since the launch of our MVP in 2012 — creating a brand spankin’ new product! In July 2017 we set out to build Creative Market Pro, a design asset subscription for professional designers. Our goal was to design, build, and launch by February of 2018. That gave us just 6 months to construct Creative Market Pro from the ground up, working together as a mostly-remote team. Our whole team collaborated by splitting into research groups that we called ‘buckets’. Each bucket had a very specific focus and a cross-functional approach to the work. Creative Market’s Brand Team headed up — you guessed it — the Branding bucket, working in close partnership with Positioning and Market Research buckets. We had 3 months to build a “Minimum Viable Brand” for Creative Market Pro. In this article, I’ll shed some light on how we approached the branding process for Creative Market Pro, what we accomplished during our 3 month branding sprint, and what it means for the future of our brand. The Brand Team at Creative Market begins every project by gathering context. To do so, we formulate internal creative briefs that help us scope out design work. So before we put pen to paper (or, more accurately, pen tool to artboard), we needed to collect all of the information we possibly could about the new product. We worked closely with the Market Research and Positioning bucket teams to get aligned around what we were building, how it was different from Creative Market’s existing marketplace product, and who our audience was for the new product. It’s subscription-based. Our marketplace runs on transactional sales of products from one creator to one consumer. Creative Market Pro allows customers to purchase a subscription, and choose from three tiers of monthly downloads. It’s a tool for teams. With Creative Market Pro, we’re aiming to help teams streamline the way they select and buy assets for creative work. Subscriptions can include multiple seats, and subscribers can use the “Projects” feature to organize asset selections across every seat in a subscription. It puts the focus on curation. Perhaps most importantly, Creative Market Pro is a special collection of handpicked, high-quality products. The intention with this level of curation is that we put our focus on finding the most unique, beautiful assets, so that designers have a ton of great choices to help them bring projects to life quickly. Once we had our scope, we kicked off the discovery phase of the project by taking time to survey the landscape we were entering. We researched the brand systems of competitors (other design asset subscriptions) as well as tools that are part of the daily workflow of design professionals. Along the way, we collected color swatches, typography samples, and other references. During this part of the process, we had a lot of group discussion about the voice and tone of our new product. We wanted to seize the opportunity to push the boundaries of our brand, while still maintaining the warm, conversational personality that Creative Market is known for. As part of this exercise, we compiled our references and imagery based on different possible visual voices, and put together moodboards for each direction. The whole design team contributed to a deep dive into typography and color palette iterations, even going so far as to study the psychology of color choices and gathering user feedback on various combinations of type. To narrow in on our color palette, we tested different combinations of tones that could hold up in both marketing and product work. Using InVision’s Freehand tool, the whole team was able to give feedback on different combinations and talk as a group about how well they fit the attributes we defined in our creative brief. Our starting point for typography on Creative Market Pro was Averta. Last year, we implemented Averta as our system font on Creative Market. Averta is a beautiful, geometric sans serif family that serves as our primary font on Creative Market. As a typeface, Averta is beautifully understated, but it also includes quirky touches that give it the right balance of polish and personality for our brand. With Averta as the thread to connect this brand’s type system back to the Creative Market, we looked for options to use for headlines on Creative Market Pro. We collected, studied, and tested tons of options, from humanist sans serif fonts to high contrast serif fonts. To assess the team’s leanings on all of these possibilities for headline type, we designed sample specimens and applications. These experiments helped us suss out how different combinations of headlines and supporting text could change the feel of imagery. After iterating on all these options, the whole team fell in love with Lyon Display. Combined with Averta, the bold weight of Lyon Display lent a confidence and elegance to the system that still worked well with our conversational voice and tone. As our bucket team went through rounds of color and type explorations, the Brand Team began rounds of sketching for Creative Market Pro’s product icon. In this early phase of sketching, we ran mind mapping exercises with as many team members as we could to get a sense of what visual associations were most in tune with the concepts behind Creative Market Pro. Besides designing a mark for Creative Market Pro, we also needed to think more deeply about our strategy for keeping a visual connection between both of the products under the Creative Market umbrella. First, we refined the execution of the original Creative Market price tag icon to contain a simple, four pointed spangle in place of the original six pointed asterisk. The spangle detail serves as a symbol to represent the ‘magic’ nature of the creative process and the spark of inspiration behind every design idea. It’s a way to represent the drive behind everything we do at Creative Market — to help people capture that ‘magic’ and use it in their creative work. This new symbol also provides a common thread to unify our suite of brand marks. In the product icon for Creative Market Pro, we focused on communicating the difference in how our users interact with design assets in the new product. 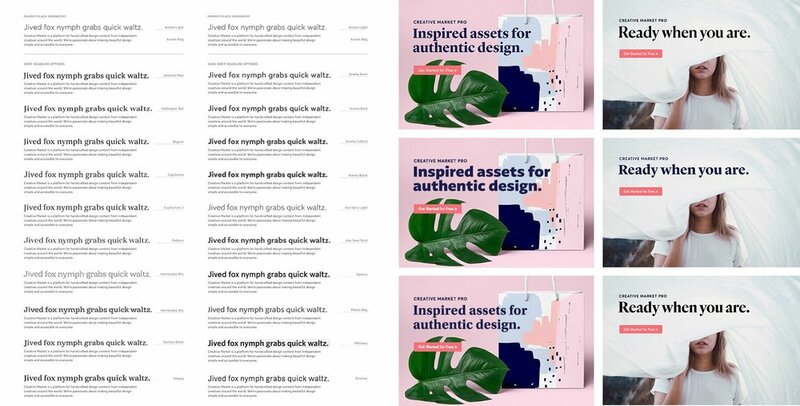 Creative Market Pro’s library of assets is made especially unique by the level of curation that goes into selecting the highest quality assets. Our icon for Creative Market Pro represents the idea of a special collection, incorporating the spangle as a nod to the spark of creative magic behind every one of those assets. Finally, we designed a central system icon to represent the overarching Creative Market parent brand. Here, the spangle is presented in positive space, surrounded by a circle that doubles as a symbol for ‘process’ and a monogram ‘C’. As we continue to grow and evolve our brand, you’ll see this mark as a supplementary piece to represent the company, with our logoscript remaining as our primary logo. Illustrations are a great way to add an approachable, conversational feel to brand and product work, and we wanted to keep that in play on Creative Market Pro. However, while our marketplace illustrations lean toward more literal illustrations, we set out to push our Creative Market Pro illustrations a little further into experimental territory. Our explorations began with design experiments for the default avatars on the site. We took seven principles of visual design, and tried different ways of distilling them into colorful, abstract motifs. From there, we ran weekly illustration exercises to explore different ways of combining motifs from our avatars with more literal illustrations. We also expanded the color palette to include a broader range of tones for illustrations. We arrived at an illustration approach that employs cool colors for physical objects and warm colors for abstract shapes and patterning. All of the elements of the brand came together in two facets of our launch materials: in product and in marketing work. The Brand Team worked closely alongside the product team to design visual motifs and spot illustrations that supported different parts of the product, from sign-up modals to instructional messaging. Lead Product Designer Noah Stokes took the brand elements and ran with them, designing a product that is polished and distinct, while still allowing the design assets on Creative Market Pro to shine through. In marketing work, we created sets of launch ads, content marketing visuals, and other promotional graphics. Finally, as part of the design team’s larger effort to document our design system, we created a light-touch set of brand guidelines to define the system. At the end of six months of hard work across the whole team, we launched a product that we’re immensely proud of. The process of creating an MVB for Creative Market Pro solidified a brand strategy that our team could rally around. Designing the MVB resulted in a kit of parts that we’ll use to connect creators with the new product. The work doesn’t stop here, though: we’re in this for the long haul. As we continue to grow, we’ll always be working to push our design system forward and evolve our brand. Be sure to keep an eye out for new developments on Creative Market. And if you’re a designer looking for a subscription service for curated digital assets, go check out Creative Market Pro!